Federal Court Says Trump Administration Can't Deny Funds To Sanctuary Cities : The Two-Way The administration wanted to use crime-fighting grants as incentives to gain the cooperation of local officials in battling illegal immigration. A federal court ruled that Attorney General Jeff Sessions exceeded his authority by requiring cities to cooperate with federal immigration officials or lose grant money for fighting crime. A federal judge in Chicago has ruled that the Trump administration may not withhold public-safety grants to so-called sanctuary cities. The decision issued Friday is a setback to the administration's efforts to force local jurisdictions to help federal authorities crack down on illegal immigration. 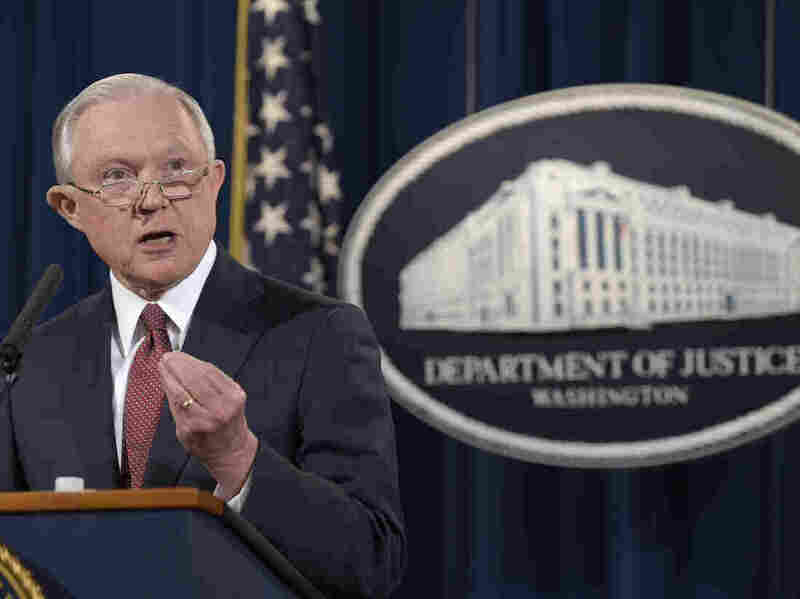 U.S. District Judge Harry Leinenweber ruled that Attorney General Jeff Sessions exceeded his authority by requiring cities to cooperate with federal immigration officials or lose grant money for fighting crime. Sessions wanted local authorities to detain people in this country illegally for 48 hours, so immigration agents could apprehend them, and allow agents into local jails. The judge issued a temporary nationwide injunction in response to a lawsuit brought by the city of Chicago. The order prevents the Justice Department from withholding grant money until there is a final determination in the lawsuit, which could take months. At stake was more than $2 million that Chicago and its neighboring jurisdictions receive from the Edward Byrne Memorial Justice Assistance Grants. Local officials around the country, such as Chicago Mayor Rahm Emanuel, have insisted that by cooperating with federal immigration agents they would jeopardize the hard-won trust of immigrant communities. Leinenweber, in his 41-page ruling, said that the city could suffer "irreparable harm." "Once such trust is lost, it cannot be repaired through an award of money damages, making it the type of harm that is especially hard to rectify," Leinenweber wrote. In a news conference, Emanuel praised the ruling as an "affirmation of the rule of law." A spokesman for the Department of Justice disagreed. "By protecting criminals from immigration enforcement, cities and states with so-called sanctuary policies make their communities less safe and undermine the rule of law. The Department of Justice will continue to fully enforce existing law and to defend lawful and reasonable grant conditions that seek to protect communities and law enforcement," said DOJ spokesman Devin O'Malley.